Crude oil prices surged yesterday and continue to do so this morning on the back of a weaker US Dollar and a huge withdraw in stockpiles. The EIA announced that Crude oil stocks in the US decreased by 3.9 million barrels in the week ending March 8 compared to analysts' estimate for an increase of 2.65 million barrels. The EIA reported that it slashed its global oil demand growth forecasts both for 2019 and 2020 but revised down its output forecasts as well to support crude oil prices. On the other hand, the 6-day long power outage in Venezuela continues to hurt the oil production and weigh on exports to provide an additional boost prices. 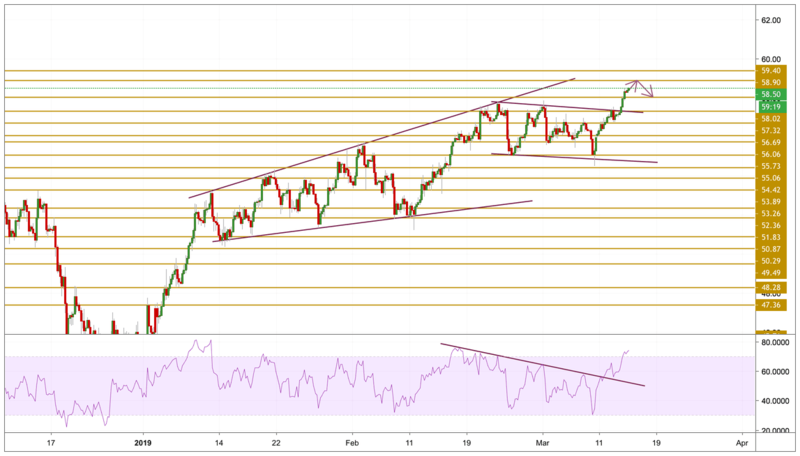 Crude oil prices broke above the upper band of the channel presented on the chart and surged to print new highs at $58.50 per barrel. The price is currently on the move to extend the upward move and printing new highs with a bullish momentum. However the overbought state could set a ceiling for future gains, that is why we will be focusing on the $58.9 resistance level and then we will be expecting a small withdraw or a consolidation.